Organic Red Walnuts are harvested in Northern California. Their shell is light colored like most English Walnuts. The skin of the walnut meet is dark cherry red and the meet itself is very light colored. The Red Walnut's stunning appearance and stronger walnut flavor makes them a perfect ingredient in salads and baked goods. Red Walnuts are low in saturated fat and high in both polyunsaturated and mono-unsaturated fat. 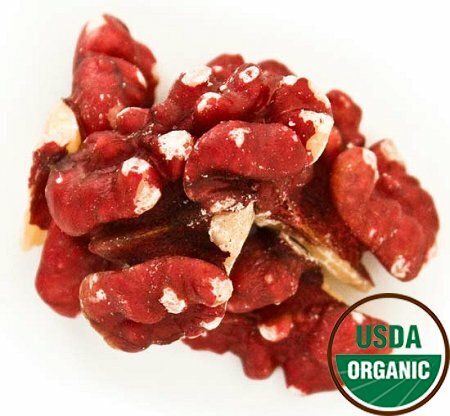 Red Walnut halves are an excellent source of omega-3 and omega-6 fatty acids, which act as natural anti-inflammatory agents, and help promote cardiac health.